In the summer I love loading up on fresh herbs and vegetables! I must admit that sometimes I go a little herb crazy and end up with things that I will never be able to use before spoiling. 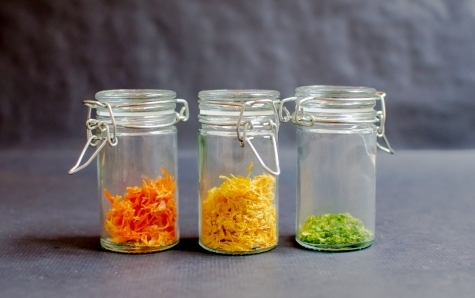 To preserve vegetables it is easy to can the extra, but for a long time I didn't know what to do with my extra herbs. Here are a few hints to keep your summer purchases good all year long. I detest buying green onions and having them go to waste in the bottom of my refrigerator. I found a solution that is so easy! After using a bunch of green onions, snip the stalk part down to about an inch. You can leave it uneven too, like if you used half a stalk, it's alright. 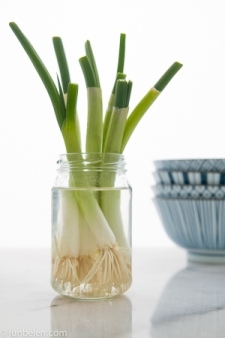 Plant the onion bunch (I leave it rubber banded), root side down in a jar of water. The roots will slowly grow, but the stalks, the part you use, will grow like crazy! Snip off the amount you need and let them continue to grow. I change my water every day, because the water does get a strong odor and can get a little filmy. I have stretched my onions to about a month. I love that I don't have to think about purchasing as often, or worrying about half a bunch going to waste. To preserve herbs there are a few options. Freezing and drying. Freezing can be done in water, or in oil or can be done alone. One great way to preserve herbs is to add clean herbs to a clean empty icecube tray. Fill the tray with water or olive oil, and freeze. After the liquid has frozen, pop the herb cubes into a zip top bag and take out a cube or two to add to dishes. Chives work well this way, as does mint. I love putting mint ice cubes straight into water or lemonade to drink. Cilantro can be preserved in oil or water, as well as basil. I have used another option to freeze my rosemary is to wash the strand lightly and pat dry between layers of paper towel. I then add it to a freezer bag and squish out as much air as possible. This will work with other various herbs as well. Cilantro, when intended for Salsa's or sauces where you don't want the extra water can be frozen dry, as well as most other herbs. Freezing may mute the flavors a bit, but is still pretty close to fresh. 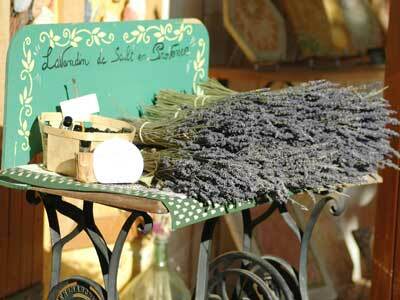 Drying herbs is another option, and my favorite for sage, rosemary and thyme. When dried this way, rosemary works best being crushed because once its dry it becomes very hard. Bay leaves and lemongrass are also great contenders for the dry preservation method. If you have little felines around your house, drying catnip could also be a fun herb addition. The trick with drying herbs this way is to make sure it can be done in a dry, well ventilated area. If you live in a wetter climate, use a warm room, or the sun if possible to prevent your herbs from molding. Using a food dehydrator is an option that will also prevent mold. To preserve orange and lemon peel in zest form, simple zest the clean, dry fruits and allow the zest to dry, then freeze in freezer bags, with as much air removed as possible. To dry larger sections of peel, string on waxed dental floss (I suggest the plain kind rather than the mint or cinnamon flavored wax) and allow to air dry. Zest could also be added to oil cubes; for example, if you are a person that likes to make roasted chicken with lemon, thyme and rosemary, all those things can be added olive cubes and added to your chicken as it roasts. To prevent the cube from sliding completely off during the roasting process, when the cube starts to set up as it is freezing, add a toothpick. When you place the cube with the chicken to cook, either use the pick as an anchor, or use the pick as a "kickstand" to keep it on the bird. Do you have any favorite preserving methods for herbs, flavorings or summer abundances?